• Service learning is a big part of our classes and programs. Students studying fashion, for example, design and sew donated fabric into T-shirts and give them away to local charities. 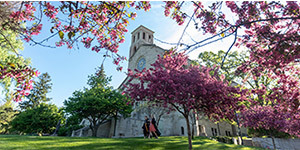 • St. Kate’s has over 80 student groups, 25 national honor society chapters (including Phi Beta Kappa), two student publications, two theater and music groups, an online radio station, and a string chamber orchestra. • Antonian Scholars participate in rigorous team-taught seminars and complete a senior honors project that relates to their major or crosses multiple disciplines. Past projects include a play and research on teaching methods for the deaf. • With a strong orientation program, peer mentors, and resident advisors, it takes no time for new students to feel at home—80% of our first-year students live on campus. • Our Women of Substance series draws inspiring speakers to The O’Shaughnessy auditorium on campus, including Nobel Laureate Toni Morrison, former Secretary of State Madeleine Albright, and singer-songwriter Jewel. • Our 11:1 student-faculty ratio ensures that professors know your name—and that research collaborations happen. Choose from nearly 60 majors, plus 37 more through partnerships with other Twin Cities private colleges. You can also design your dream major, like Pre-vet or Sociolinguistics. Who better than women, the world’s most powerful force? Where better than at a university for women? At St. Kate’s, we educate women to lead and influence. We integrate the liberal arts into our curriculum, so you’re not just conducting a science experiment or learning Plato’s philosophy—you’re learning how to analyze complex situations with clarity and compassion and how to work with all kinds of people. St. Kate’s is the largest Catholic women’s college in the nation. Course work at our University is rigorous, and podium lectures are rare. Here you’ll find a free-flowing exchange of ideas, perspectives, and life stories as well as field work, internships, study abroad opportunities, and collaborative projects. 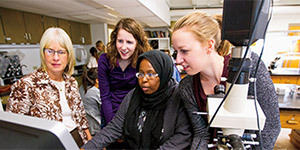 St. Kate’s ranks in the top 5% of colleges and universities nationwide for an “unusually strong commitment to undergraduate teaching,” according to the “America’s Best Colleges” guide by U.S. News & World Report. Our students frequently partner with faculty on original research studies that are presented at regional and national conferences and published in peer-reviewed journals. In fact, for the last three years, 100% of students involved in collaborative research have been accepted to present at the National Conference on Undergraduate Research. Student Stephanie Burrows worked with Dr. Art Sesma to study families in homeless shelters. Alumna and current graduate student Carol Goulet worked on three body-image studies with Dr. Lynda Szymanski, her mentor. 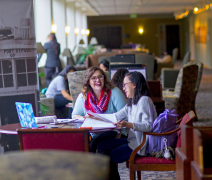 We offer valuable job connections and career advice through our Career Development Office, Assistantship Mentoring Program, Alumnae Career Transition and Networking Group, and annual Career Opportunities Fair, the largest among private colleges in Minnesota. Our popular Business Practicum course includes career coaching and business internships. St. Kate’s graduates go on to become CEOs, senators, congresswomen, judges, teachers, scientists, doctors, librarians, writers, healers, social workers, and more. Nearly 93% of St. Kate’s students are working full time or enrolled in graduate school within six months of graduation. Employers say our graduates are strong critical thinkers, persuasive communicators, and initiators in their careers. The Sisters of St. Joseph of Carondelet founded St. Kate’s more than 100 years ago—and our focus on excellence, the liberal arts, social justice, women’s ways of knowing and learning, and our Catholic identity remains strong. Our 110-acre campus is minutes away from the downtown Twin Cities of St. Paul and Minneapolis. We’re a short walk to Highland Park, a vibrant neighborhood with coffee shops, consignment stores, bookstores, and a charming movie theater. At St. Kate’s, you learn to look at the world from different perspectives—and to challenge accepted ways of thinking and behaving.